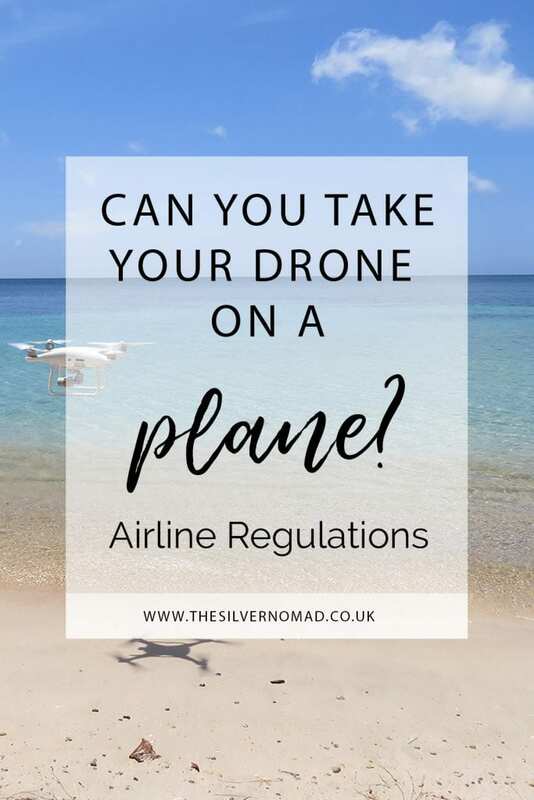 With more people travelling with a drone, particularly travelling with a drone by plane, adhering to individual airline regulations can be crucial. Questions I have been asked include: Can I take my drone on a plane? Can I take my DJI Mavic Pro/DJI Phantom 4 Pro/Lithium Batteries on a plane? Which airlines do you have to put your drone in the hold? What is Wh? Lithium batteries are used to power most drones and when taking them on board planes the guidelines by the FAA and the CAA tend to be in Wh or Watt/hours. It is worth checking with the countries guidelines before flying. To convert amp-hours (Ah) to watt-hours (Wh), multiply (Ah) by voltage. Normally your batteries need to be under 100Wh before you have to advise the airline. As a rule I would make sure that they are in LiPo bags and not kept in your drone. I have tried to make this as comprehensive as I can, but I have not included some of the smaller airlines. Always check local airport and airline rules before you fly as these guidelines can be changed at any time by the airlines. Aer Lingus’ list of Restricted and Prohibited items does not include drones, so you can take your drone on board. If you are travelling with lithium batteries between 100Wh and 160Wh you must contact Aer Lingus at least 48 hours in advance for approval. Read Aer Lingus’ list of Restricted and Prohibited Items. Air Canada accept drones as carry-on luggage as long as they are turned off and safely stowed at all times. They will also allow you to check them in as hold luggage if the lithium batteries are removed and carried in your hand luggage and the drone is properly packaged, which I assume you would do anyway! Interestingly they don’t say if lithium batteries need to be in LiPo bags, but as a precaution I would do it anyway. Read Air Canada’s guidelines under Battery-Powered Vehicles and Devices. Air China do not have any clear policy on drones, and as they are not on the list of banned items, they will accept drones as hand luggage. Their website also mentions that you can take up to 15 spare lithium batteries under 100Wh in hand luggage, if you can carry that many! Read Air China’s information on their Dangerous Goods Information page. Air France are very concise with their regulations. You can take your drone as hold baggage or cabin baggage as long as it is less than 100Wh. As usual lithium batteries less than 100 Wh are okay in the hold luggage and between 100 and 160Wh need to have prior approval (Authorizations should be requested from Air France or your travel agency). For full details go to the What Can I Take? page on Air France’s website. Drones are not mentioned on their website. Protected lithium batteries up to 100 Wh must be in carry-on luggage, though if they are installed in electronic equipment they are allowed in check-in luggage. I would say that drone batteries are not classed as installed so should be in hand luggage. You must advise them when you book that you are carrying lithium batteries between 100 Wh and 160 Wh and you are limited to 2 only. For more information have a look at Air New Zealand’s Travelling with Lithium Batteries and Carry-on baggage prohibited and restricted items pages. The rules for American Airlines are quite clear: The drone’s battery must not exceed 160 Wh and drones can be hand luggage if it or its box is less than 22 x 14 x 9 inches / 56 x 36 x 23 centimetres. Lithium batteries must be removed and put in carry-on luggage and put in separate bags (they call them plastic bags, but LiPo bags are safer). You are allowed unlimited batteries Less than 100 Wh, but only 2 spare 100 – 160 Wh ones. Full details for American Airlines on their Restiricted Items page. Although not specifically mentioned on the British Airways website, they would come under the category of Batteries, Electric and Electronic Devices. Up to 4 spare batteries up to 100Wh can be taken on in their original packaging or in LiPo bags. Batteries between 100Wh and 160Wh can be taken, but you need to contact BA for approval first (+ 44 (0) 20 8738 8357 or safety.1.safety@ba.com). Clear guidelines are given on the Brussels Airlines website and actually states that drones are preferably placed in your hand baggage unless they are too big to fit in the hand luggage sizing. Up to 20 spare batteries under 100 Wh can be taken in your carry-on. If your batteries are between 100 Wh and 160 Wh, you have to get prior approval to carry up to 2. You can contact Brussels Airlines by email – dgdepartment@brusselsairlines.com. Brussels Airlines’ policies are detailed on their DDangerous goods, prohibited and restricted articles page. Drones are not mentioned on the Cathay Pacific website, Up to 20 spare lithium batteries under 100 Wh can be carried in hand luggage per passenger though the batteries must be either enclosed in original retail packaging, with the terminals taped over or each one placed in a separate plastic bags. Interestingly Cathay Pacific also say that they have to have visual verification that lithium batteries between 100 Wh and 160 Wh are securely packaged. To read more about Cathay Pacific’s guidelines go to Controlled and Banned Items. Although not specifically mentioned, drones would come under the heading of Personal Electronic Devices as they contain lithium batteries and therefore carried in hand luggage and not put in the hold. You can carry up to 20 spare lithium batteries up to 100 Wh and 2 spare 100 to 160 Wh lithium batteries, each battery should be in its own protective LiPo bag. Click to read more on Delta’s rules about Restricted Items. Like most other websites, drones are not mentioned, so I have followed the guidelines for Personal Electronic Devices which says that they can either be in the hold or hand luggage as long as the batteries are under 100 Wh. As for carrying spares, they must be carried in hand luggage in protected bags. You can read easyJet’s regulations on their Dangerous Goods page. It is Emirates policy that drones are NOT allowed to be taken onboard as hand luggage. This includes Emirates flights that connect to another airline who do accept drones on their planes. LiPo batteries under 100Wh must be in LiPo bags. Special approval is need for batteries over 100Wh. See Emirates Dangerous Items information for drones and drone batteries. Remote controlled drones can be taken on FlyBe flights but must have the batteries removed and be packaged securely and put in your HOLD baggage, this includes the controls and the mounted camera. There does not seem to be any direct advice, but they do point you to the EASA YouTube video on lithium batteries which says they should NEVER be put in the hold. I would follow normal CAA guidelines and put them in individual LiPo bags. I did have to do a search for the FlyBe information on their Search Page under Other Electrical Devices. There is no mention of drones on Garuda Indonesia’s site, so I would follow that you can take them on as carry-on luggage. Lithium batteries under 100 Wh are allowed in your hand luggage, but you have to get approval for batteries from 100 Wh to 160 Wh. You can see Garuda Indonesia’s policy on their Baggage page under Lithium Batteries. KLM don’t actually specify if the drone can be in hand luggage, but is clear on lithium batteries: Up to 100 Wh you just carry them in your hand luggage in LiPo bags, but it says “To bring a drone with a lithium battery from 100 Wh up to 160 Wh you need special permission” and it also points out that all airlines in your itinerary must agree to it. For further clarification go to the Ask Your Question page and type in drones. Lufthansa’s website had no mention of drones as hand luggage or even really much on spare lithium batteries, just that they have to be in your hand luggage. Have a look at their pdf on Dangerous and Prohibited Goods. Check it out for yourself on their FAQ articles. There is no mention of drones on the Norwegian Air Shuttle website. You can take up to 20 spare lithium batteries under 100 Wh on as cabin luggage, as long as they are protected without getting approval. However, approval is needed for batteries between 100Wh and 160Wh. They will have to be protected (terminals capped or in LiPo bags), a maximum of 2 and carried in your hand luggage. Norwegian Air Shuttle’s page on Dangerous Goods under Lithium Batteries gives more information. The Philippine Airlines website does not have any advice about carrying drones on board, so assume that they can be taken as hand luggage. Lithium Batteries under 160 Wh are to be taken in your carry-on luggage. No details of how many you can carry or if they have to be protected, but use your common sense and protect them anyway. Find out more on Philippine Airlines Restricted Items page. Despite searches on their site, I cannot find any mention of drones being disallowed in carry-on baggage. Lithium batteries must be carried in carry-on baggage. You can carry up to 20 lithium batteries under 100 Wh without having to alert the airline; but you must alert them if your batteries are between 100 Wh and 160 Wh. For safety’s sake store them in LiPo bags or have their terminals taped over. Qatar Airways do not mention drones on their site, but they do mention that if the lithium batteries are left in the equipment then they can be put in the hold for batteries up to 160 Wh. Otherwise their standards for lithium batteries are up to 20 under 100Wh have to be taken as hand luggage without the airlines approval and up to 2 lithium batteries between 100 and 160Wh must be in hand luggage and you need Qatar Airways approval.. In both cases lithium batteries should be in original packaging, or LiPo bags or have their terminals taped. Qatar Airways list their requirements on their Restricted Baggage Items under Lithium Batteries. Like most of the other airlines mentioned, Royal Brunei does not mention drones on its website, even when you do a search for them. Lithium batteries up to 100 Wh are allowed to be put in checked in luggage as long as they are in equipment, but it is recommended that they are taken as carry-on luggage. Up to 12 spares must be in carry-on luggage in original packaging or with terminals taped up or in individual LiPo Bags. The same rules apply for lithium batteries from 100 to 160 Wh, but you are only allowed 2 spares. Royal Brunei guidelines are listed on their Travel Smart Stay Informed page under Lithium Batteries. Ryanair’s Policy is on their Permitted and Restricted Items under Drones/Quadcopters. A search of TAP Portugal’s site came up with the news that you are NOT allowed to take drones on as hand luggage and they must have the battery removed and be put in your checked-in luggage. Up to 15 lithium batteries under 100 Wh are allowed in hand luggage and approval is required for lithium batteries from 100 Wh to 160 Wh and you can only carry 2 spares. All batteries must be individually protected in LiPo bags to prevent short circuits. Read TAP Portugal’s Guidelines for Dangerous Goods under Section 3, 4 and 8. No mention of drones on the Virgin Atlantic website. The section Items that will need our permission in advance to be taken onboard Includes Lithium batteries up 160 Wh which can be checked in to hold luggage or carried as hand luggage. There are no guidelines as to how many you can take. Contact Virgin Atlantic for approval of your lithium batteries before you fly. Virgin Atlantic’s policies are laid on their Dangerous Goods and Restricted Items page. Only 4 Airlines from my list of 23 seem to have issues with drones: Emirates, FlyBe and TAP Portual say you MUST put them as hold luggage and Malaysian Airways DO NOT ALLOW drones. I hope that airlines will start giving more guidelines about carrying drones on airplanes , although this might lead to more airlines requiring them as checked in baggage. remember to check the guidelines for all airlines you are flying with. If you are booking through a travel agent, tell them you are carrying a drone. Do not assume that they know the restrictions, so get them to check. It is worth double checking yourself, just in case as if the travel agent gets it wrong. if your batteries are over 160 Wh you have to check with the airline before you fly. If in doubt contact the airline for guidance. I have tried to make this post as comprehensive as possible, and I do realise that there are other makes of drones out there and also other airlines. If you would like me to add a particular airline, just drop me an email, on my contact page.